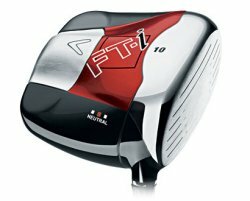 With the revolutionary 460cc Complete Inertial Design, the FT-i Driver pushes the boundaries of shape, of our imagination, of the rules. By positioning weight to the extreme corners of the clubhead, the FT-i Driver produces the highest Moment of Inertia of any driver on the market today, resulting in unparalleled forgiveness. Our largest, most robust CT/VFT Titanium cup face is designed to the legal limit as defined by the USGA Characteristic Time test, for increased ball speed, distance and forgiveness. From Anonymous of San Diego, California on 6/27/2007 . This club is the perfect improvement over the last model.